The MMU may have been the coolest space vehicle ever. So why did its career end as soon as it began? 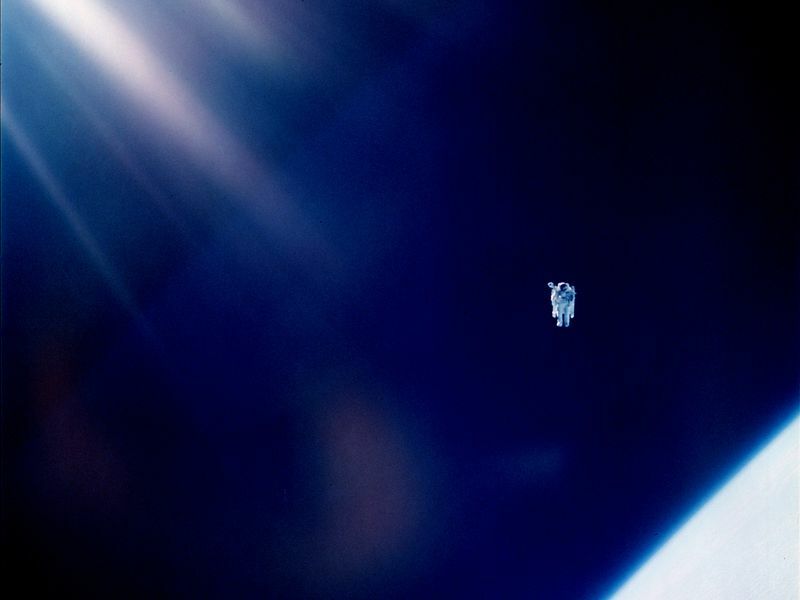 The picture is one of the great mind-blowers of the 20th century: Astronaut Bruce McCandless is a tiny, free-flying satellite, 300 feet from the space shuttle Challenger, on the first test flight of the Manned Maneuvering Unit in February 1984. Never mind the personal thrill for McCandless, who had waited 18 years for his first spaceflight, 16 of them spent developing the rocket-powered MMU. The test on shuttle mission STS‑41B was the realization of a dream dating to the early 1960s, before anyone had walked in space, when planners envisioned a jetpack that would let astronauts move effortlessly among space stations and satellites. McCandless’ untethered sortie seemed to herald a new era for spacewalkers. Yet by the end of 1984, the MMU had made its last flight, ending a brief, if spectacular, episode in the shuttle era. What happened? As alluring as it still seems, the vision of a free-flying astronaut was never a sure thing. Air Force planners developed a prototype of a propulsive backpack in 1962, and a flight model called the Astronaut Maneuvering Unit (AMU), outfitted with hydrogen peroxide thrusters, reached orbit aboard Gemini 9 in 1966. But the AMU’s test flight by Gemini 9 spacewalker Gene Cernan had to be canceled when the exertions of working within a stiff, pressurized spacesuit overwhelmed his suit’s rudimentary cooling system. The AMU’s creators thought it would get another try on the final Gemini mission, in late 1966, but by that time, stinging from a series of troubled spacewalks and determined to end the program with a successful EVA (extravehicular activity), NASA managers refused to risk it. When Gemini ended, hopes for a maneuvering unit seemed to end with it. Not for long. By 1967 a new champion of astronaut self-propulsion had emerged at NASA’s space center in Houston—a young Air Force officer with buzz-cut hair and a shy smile named Ed Whitsett. “The guy was a dynamo,” remembers NASA engineer Joe McMann. “Yet to look at him, you’d never think it. He just looked like a meek guy.” Before long Whitsett had an equally passionate collaborator in rookie astronaut McCandless, an ex-naval aviator who’d spent his first years at NASA playing supporting roles on Apollo. “He was a fanatic,” says McMann. 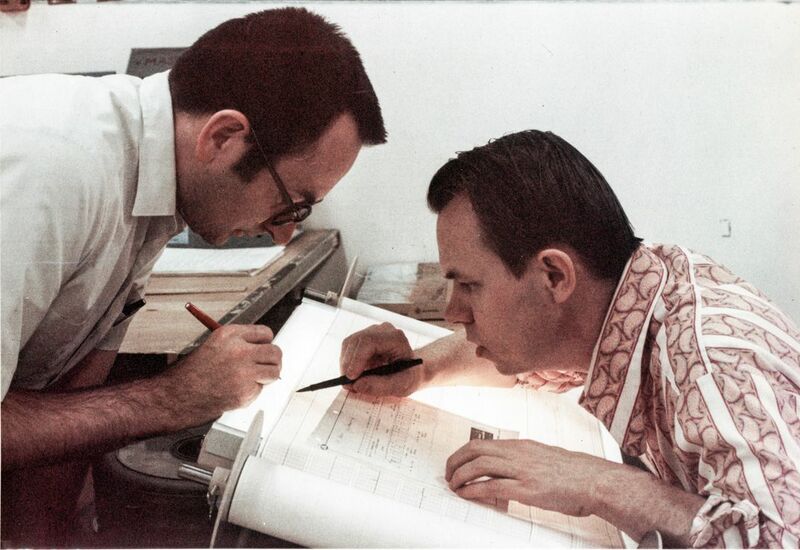 “He ate, slept, and breathed it, just like Ed did.” Together, Whitsett and McCandless began working on a design for an astronaut jetpack. NASA chose their invention as one of the experiments to be conducted inside its planned Skylab space station. Propelled by compressed nitrogen, the unit had 24 thrusters for “translating”—moving forward or backward, side to side, or up and down—as well as rotating around the roll, pitch, and yaw axes. 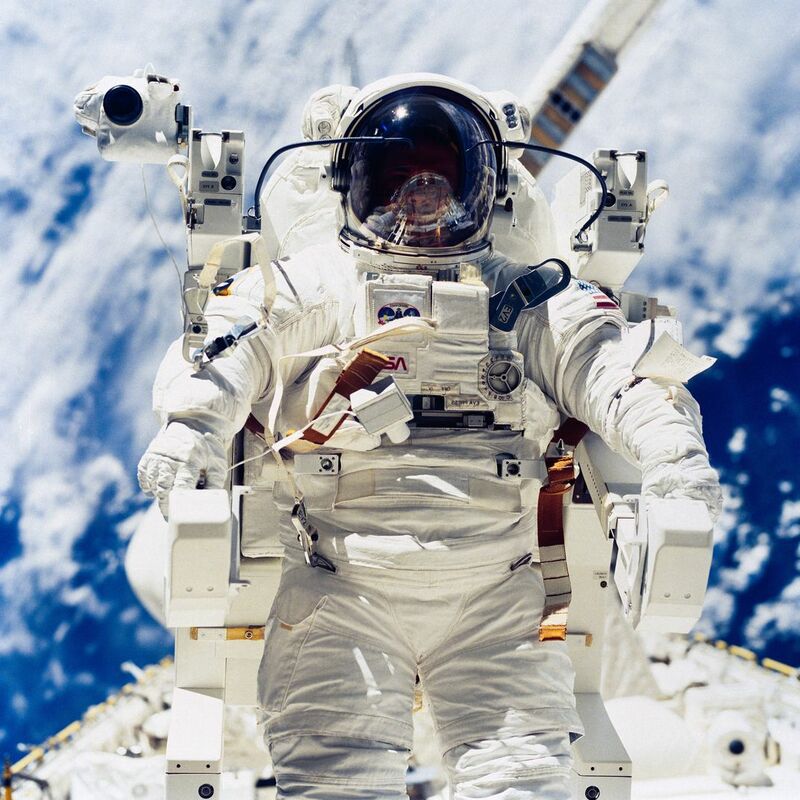 Powerful gyroscopes inside the backpack could hold an astronaut steady without using fuel. Built by Martin Marietta Aerospace in Denver, the unit was known by its official designation: M-509. Skylab also carried two other designs for maneuvering systems, including a hand-held “zip gun.” Although far less capable than Whitsett and McCandless’ backpack, the gun was favored by some in Houston because it was relatively inexpensive, and had been built in-house. NASA’s Langley Research Center in Virginia threw its hat in the ring with a foot-controlled maneuvering unit designed to leave the hands free. In a kind of orbital fly-off, Skylab crews tested all three units inside the station’s cavernous workshop in 1973-1974, and the M-509 emerged the clear winner. Even scientist-astronaut Owen Garriott, who hadn’t received any preflight training on the backpack, flew it with ease. 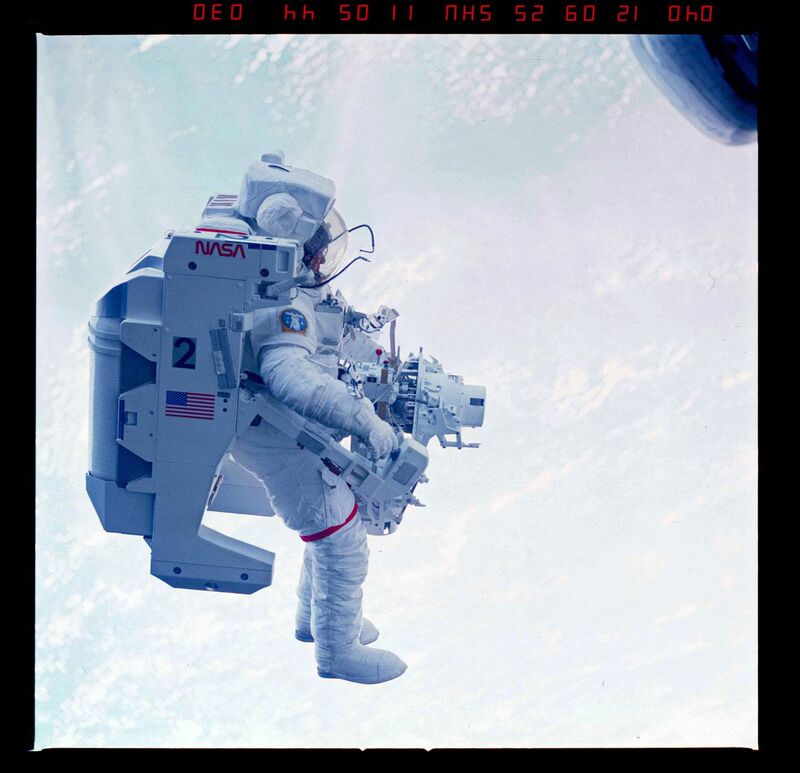 With the Skylab success, Whitsett and McCandless focused on their ultimate goal—a maneuvering unit for spacewalkers aboard the spacecraft then in development, the space shuttle. But certain malfunctions—for example, something preventing the shuttle’s payload bay doors from closing—could be fixed only during an EVA. And if a shuttle crew were stranded in orbit, a rescue would have to be attempted. In one scenario, each astronaut would be zipped into a pressurized fabric sphere to be transferred to a second shuttle—with help, Whitsett and McCandless hoped, from their maneuvering unit. But that plan was scrapped because keeping a rescue shuttle on call for every mission wasn’t realistic. Whitsett and his team kept on the lookout for other problems that a maneuvering unit could solve. By late 1978, as concerns mounted over the shuttle’s fragile thermal protection tiles, the two were pitching the MMU as a way for astronauts to repair damaged or missing tiles in orbit. But new techniques for strengthening the tiles before flight undercut that idea. Still, McCandless says, Whitsett (who died in 1993) never seemed to lose heart. “This was more than just a job for him,” he explains, adding that “Ed was a genius at getting yet another few thousand or tens of thousands of dollars to study yet another aspect and keep the program alive.” Finally, in late 1980, just months before the shuttle’s first launch, they got the opportunity they’d been waiting for. NASA’s Solar Maximum Mission satellite, launched earlier that year to study the sun, had been crippled by a malfunction in its attitude control system. Solar Max was designed to be serviced, and in the summer of 1982, NASA made the decision to have astronauts repair the satellite in the shuttle’s cargo bay. For that to happen, one of them would have to capture Solar Max. And for that, he would need the MMU. To extend battery life, the big power-hungry gyroscopes used to maintain orientation on the Skylab version were removed. 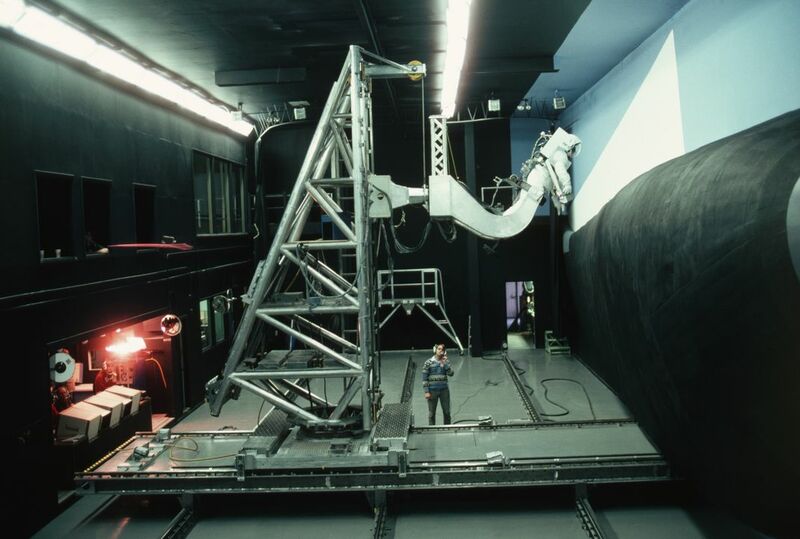 The MMU’s control system would use smaller gyros to sense rotation, then immediately fire thrusters to counteract it. Also, the M-509’s pistol-grip hand controllers, which were tiring to operate in pressurized spacesuit gloves, were replaced by small T-handles that needed just a nudge of the fingertips. Adjustable control arms would accommodate the tallest and shortest astronauts. Two MMU flight units were completed in time for a test on shuttle mission STS-41B in February 1984, with McCandless and fellow rookie Bob Stewart named as the first pilots. Before joining NASA, Stewart had been an Army test pilot, and had worked on development of the Apache and Black Hawk helicopters. First the two astronauts had to persuade shuttle bosses to let them fly the MMU the way it was designed: untethered. Back in 1966, worried that Gene Cernan could end up a permanent Earth satellite, managers had insisted the AMU be operated with the astronaut attached to a 75-foot lifeline. Now, for the MMU, they were talking about a tether 300 or more feet. According to McCandless, NASA spent $3 million to develop what looked like an oversize fishing reel mounted on the front of a spacesuit: If the jetpack conked out, its pilot could simply crank a handle and pull himself back to the payload bay. McCandless and Stewart wanted no part of it. Even if nothing went wrong with the MMU, they argued, the tether could easily get tangled around the shuttle’s high-gain antenna, or the robotic arm, or an astronaut’s foot. Or suppose the MMU did fail, and you tried to reel yourself back—how would you keep from colliding with the orbiter? Furthermore, they pointed out, if you had any sideways or up-and-down velocity to start with, you’d probably end up wrapped around the shuttle, with what McCandless wryly terms “undesirable consequences.” In the end, the astronauts managed to convince the brass that it would be safer to fly without a tether. The MMU development team found the managers’ anxiety understandable but misplaced. Each unit was protected against failures by near-total redundancy—two sets of thrusters, fuel tanks, regulators, valves, electronics, wiring, and batteries. McCandless says that when it came to possible malfunctions, “I can’t think of a single worst-case thing.” Even a stuck thruster, like the one that had sent Neil Armstrong’s and Dave Scott’s Gemini 8 spinning wildly through space in 1966, would hardly be a nightmare scenario; the pilot could simply turn off the bad thruster bank and use the backup set to stop any unwanted motion. In the unlikely event that both sets went haywire and had to be shut down, the astronaut would still not be stranded, because the MMU moved so slowly. The 1.4-pound thrusters were so gentle (astronaut Joe Allen, who used the jetpack on a later mission, likens their force to “a child blowing through a straw”) that an MMU flier would never outrun the shuttle, which could easily fly over and scoop him up in the cargo bay. In fact, before the test flight, mission commander Vance Brand practiced doing exactly that.